This area is dedicated to our valued travel agent partners and is designed to provide you with all of the information, training and materials required in order to sell our holidays with confidence. Here you will find our latest news, point-of-sale materials, details on our forthcoming educational trips and the contact details for our agency executives. 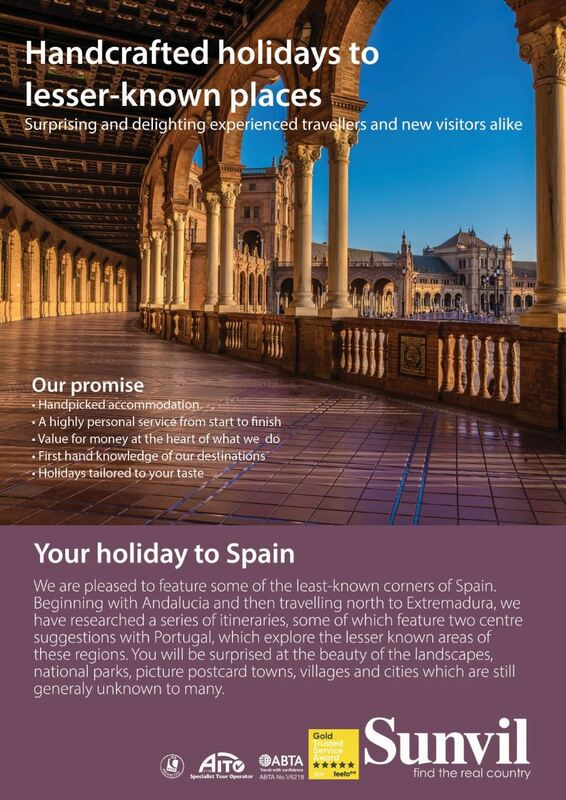 Since 1970 the team at Sunvil have been creating original and innovative holidays to Europe and further afield. Our approach is refreshingly unique. We do not feature any large, commercialised resorts. 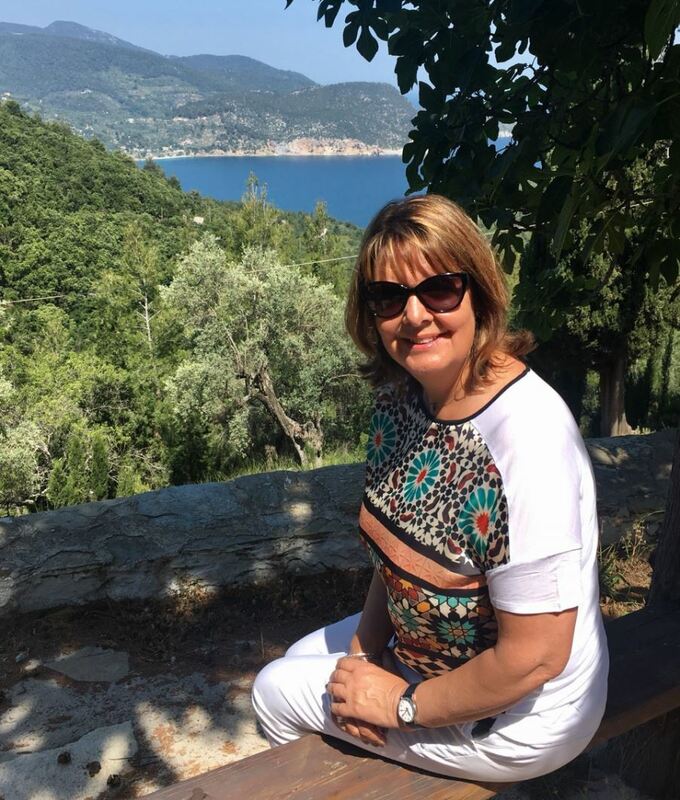 Instead, using our years' of experience and local knowledge we have handpicked accommodation in some of the most picturesque spots, atmospheric villages and charming coastal towns that we know - places where we know that your guests will receive a warm and genuine welcome. Our reservation experts, many of whom have been with us for years, are passionate about our destinations and, through their personal, first-hand knowledge can answer any questions that you may have and work with you to carefully-craft the perfect trip for your clients. Our aim is to introduce our guests to the real country and to enable them to immerse themselves in the local culture. Our holidays are bonded by the CAA (ATOL: 808) and ABTA (V6218) and we take full responsibility for all elements of the package we provide. What's more, with our 24 hour emergency telephone number and team of trusted local agents and representatives you can relax in the knowledge that your guests will receive the service and care that you desire. Our agency sales team is on the road and available to support you with in-office training on all Sunvil products and with display material. We are also happy to host webinar training events and to be considered for your consumer events throughout the year. Furthermore, each year we lead familiarisation trips to many of our holiday destinations. Our trips are designed to highlight the best of the region visited and happily combine hotel visits with local activities and experiences. Brochure supplies can be ordered on BP Tradegate. You can also follow us on Facebook - join our agent page here, on Twitter (@sunvilteam) and on Instagram (@sunvilteam). Register for our weekly newsletters by emailing marketing@sunvil.co.uk. Each week, during April and September, we release our latest Greece holiday offers. 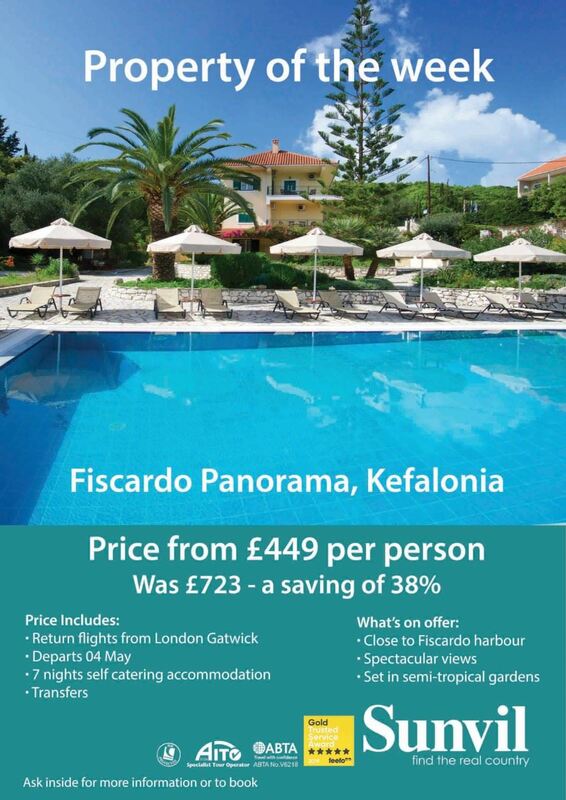 Starting from £389 per person our offers represent savings of up to 45%. All holidays include return flights, shared resort transfers or car hire and accommodation. In the majority of our destinations your clients will also benefit from the services of an experienced local representative. 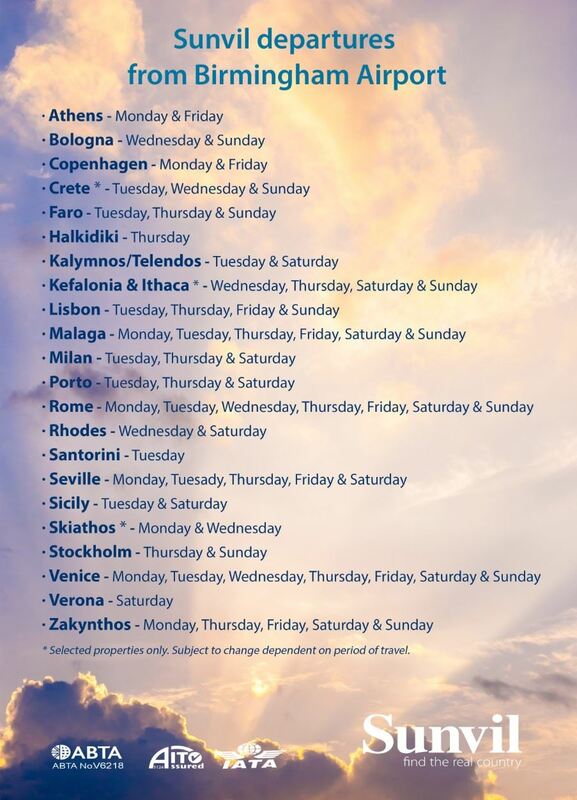 Easy to travel to, and with a range of our holidays to choose from, jetting off from a regional airport to a choice of destinations couldn’t be more convenient. See our collection of flyers* detailing which Sunvil destinations are served by your regional airport. Two people for the price of one when YOU travel to the real Greece with Sunvil this spring. Time flies when you're having fun, or when you're busy selling holidays. To think that Sunvil has been operating since 1979 and that I have been part of the Sunvil team since 1994 is... well... crazy, really. It has passed in the blink of an eye and I can honestly say that my journey has kept me enthralled throughout. In our fast-paced world the need for a holiday is even greater. This is why we are pleased to launch a buy-one-get-one-free offer for our industry partners. The promotion is available on selected properties, as detailed. I hope that we can tempt you to sample the delights of a Sunvil holiday first-hand this year. If you have any questions or require any guidance on the property to choose, please call our dedicated Greece team on 020 8758 4758. Properties included within the offer. Valid for stays between 03 May and 17 June 2019 - Selected dates.